Before I discuss the Rg Veda Mandala 1 Hymn 24, Let us understand Vaisravana. If Apa are photons, then Vaisravana are Color Charge or more specific the Gluon Flux Tubes or Color Flux Tubes. Vaisravana is called Sriyam or having the property of Sri and hence the brother of Sri. Color charge is the property of matter that creates a multitude of fermions and hence the wealth of all the Universe. That Vaisravana is Color Charge is understood from a reading of the Aruna Prashnam, which conveys that Apa are photons. In the ocean of unmanifesing/disappearing breast was born your Vaishravana, rivals always come into this unmanifesting/disappearing breast as they confume/feed on some of our Apa. 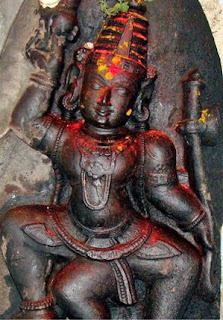 Tirodha is derived from tirah+udha. Tirah means umanifest/disappear. Udhas means the breast/udder. Tirah Udha is the unmanifested/disappearred breast (of the Universe). abhdyas is ocean. Abhdyas tirodha is ocean of unmanifested breast. Science says at the origin of Universe, Universe was an ocean of photons or light. This ocean of photons is indeed the unmanifesting breast of this Universe, that nourishes this Universe always. On this ocean of photons, consuming some photons come into existence ‘rivals’ says this sloka. Science says Quarks and Anti-Quarks form in this ocean of photons, as some photons split into quarks and antiquarks. Quarks and AntiQuarks the rivals. Ok. So what is Vaisravana that is born in this unmanifesting ocean of breast..? The illusory energy/material energy/rest-mass (mAyAm) of Tvastr is by the Vaisravana. Vaisravana is the one that causes the material energy/rest-mass of Tvastr. I had translated Tvastr as B-mesons and mAyA as rest-mass. B-mesons consist of a Bottom anti-quark and a up/down quark. So Vaisravana is the one that causes the B-meson’s material energy or rest-mass. Science says Color charge (Color Flux Tube or Gluons) enables the formation of Tvastr or B-mesons out of the Quarks. The rest-mass of the Quark combinations arises out of the Color Charge. Thus Vaisravana is the Color Charge. The force-field of Color charge enables the formation of mesons, baryons and other exotic forms of quark combinations. Vaisravana having mounted a chariot with innumerous carriage-seats, multiple wheels and driven by innumerous horses. Vaisravana, the color-charge field is not perceptible. But when it mounts on Tvastr, the B-mesons (or other quark combinations), it is seen. In the early Universe, on the ocean of photons or light, the first to form are innumerous quarks, antiquarks, gluons and then the B-mesons. The Vaisravana or color charge or gluons makes the rivals quarks and antiquarks to combine and form those innumerous B-mesons. Vaisravana the gluon/color flux tubes, thus become one that is riding a chariot with thousands of seats, multiple wheels and driven by thousands of horses. Vaisravana, the color-charge field having mounted the Tvastr or B-mesons, comes in as the ‘bali’ or offering in the Evolutionary sacrifice. From the B-mesons all mesons and baryons form as the evolution (evolutonary yajna) proceeds. Vaisravana mounting the chariot of Tvasta makes it the oblation to produce a wealth of matter. I translate gAvo as leptons, Elephants as massive W,Z Bosons and Horses as inert neutrinos. I had always translated ‘hiranya’ as ‘inert’. The Color Charge or gluon flux tubes mounting on Tvasta, the B-mesons makes it the ‘bali’ or offering that produces innumerous wealth of matter in the early Universe. The refined (a-sAma) mind (sumatau) sacrifice’s/evolution’s (yajnasya) property of consciousness (sriyam) assuming (bibhrata) food-faced (anna-mukhim) universal form (virAjam) in the Sudarasana and Kraunca and such great mountains, extending/moving (gam) the limit (anta) of equal length on both sides from the inert center (dve sata), drawing together (saMhAryam) your city/abode (nagaram). The refined mind sacrifice’s property of consciousness, assuming food-faced universal form in the Sudarsana, Kraunca and such great mountains, extending to the limit of equal length on both sides from the inert center, draws together your abode. Vaisravana is said to be food-faced. Gluon tubes are food-faced in the sense they are 'consumed' by the quarks and digested. Vaisravana makes the ‘bali’ in the Yajna or evolutionary sacrifice. ‘Bali’ is the food in a Yajna or evolutionary sacrifice. Color charge or Gluon tubes make the Quarks into mesons and baryons which are sacrificed further to form the next set of elements and compounds. Hence it is Vaisravana that makes the Bali or offering to evolution. Without Color charge or Gluon tubes, quarks do not become mesons or baryons. Without Color charge evolution will not proceed. Hence Color charge makes the ‘food’ or ‘bali’ out quarks. The Color charge is digested in the matter and becomes the property of Consciousness. All the consciousness that rides on all matter in this Universe is referred to as ‘Sri’. Hence Vaisravana is said to be brother of consciousness or brother of Sri. Once upon a time when universe was a Quark Gluon Plasma, there arose mountains of Baryons, mesons and other exotic Quark combinations. Vaisravana resided in these mountains within the limits of equal distance on either side. Science says the color charge force field travels (gam) within the limit (anta) of the nucleus (inert center of every atom), in the nucleons of different atoms (different mountains). So what are sudarsana, kraunca, mainaka etc..? They are names of mountains that are extremely visible (su darzana), mountains that cannot move (Kraunca) and mountains that still move (mainaka). These are mountains of Quark combinations that arose in the early Universe, that become the nucleus of different elements. There are stories in puranas that say mountains ‘flew’ or moved from one place to another in the early Universe. The baryonic, mesonic and other exotic quark combination of formed in the early Universe, out of the Quark gluonic plasma. They moved continuously in the sense that many exotic matter forms (mountains in QGP) kept forming only to get annihilated and re-appear at other places. Quarks combined due to color charge and formed exotic flavor of quarks, got annihilated, reappeared and this was going on. But when Indra (Three quarked baryons) asserted his supremacy, that is when baryons became predominant matter form, the wings of the mountains or the movement of the nucleonic mountains got stopped, as stable nucleus formed out of three-quarked baryons. Vaisravana resides within the limits of these mountains. Color charge resides inside its quark combinations and never comes out. The gluon tubes never exceeds the quark combinations that it forms. This mantra, It is said/Certainly (uta) in life-time of Universe (kalpa) if (yadi) any ‘bali’ done (baligum haret), the bali/offering has (ayam bali) the one that originates from the inert center (Hiranyanabhaya), the one that whips up (Vitudaya), the one that deforms (Kuvera). It is said in the life-time of Universe if any bali is done the bali has the one that originates from the inert cente, the one that whips up matter and one that deforms the matter. When energy is acquired by quarks, the gluon flux tubes elongate and at some point break or deform into quark antiquark pairs. Thus the vasiravana or gluon flux tubes get continuously deformed producing new matter. Salutations to the Lord of all matter. After/Then (atha) Vaishravana taking the bali by force (baligum hrtvA) the balim submits (upatishTheta) to the class, order (kshatram kshatram) of Vaishravana, the evolutionary (brAhmana) weaver of the past (vaya sma), to whom submission (namaste astu) is largely not (mA mA) injurious (higuMsi). From this entering (asmAt praviSya) is desired the grains (adhIti annam). Then (atha) that (tAm) receiving of Agni (agni Ada) is desired (dhIta). In which (yasmin) thus (etat) action may take place (karma prayunjita), that tirodhA becomes the bhu, bhuva and Sva. Time in which/In course of time (yasmin asya kAle) all oblations (Ahutir) would be burnt (hutA bhaveyu). In course of time, vaisravana siezes all the ‘Bali’ and burns them up. In other words Color Charge/gluon flux tube seizes all the quarks, makes them into fermions. The lord of all on all matter (sarveshAm lokAnAm Adhipataye) and beings is seated (sIdeti). Then that (atha tAm) Agni is kindled (agnim indhita) in which (yasmin) thus this action takes place (karma prayunjita), that tirodhA becomes the bhu, bhuva and Sva. Thus in the ocean of ummanifested breast, with the entry of Vaisravana, agni or transfer of energy gets placed. When the Vaisravana gets seated fully, the agni gets kindled. When these happen the unmanifested breast becomes the whole Universe. This Vaisravana is called the ‘agra piNDa juhomi’ meaning the make of the first ball of flame. It is the invoker of transfer of energy or Agni. Before Vaisravana, agni or transfer of energy was not invoked and hence the Universe remained ‘Tirodha’ or unmanifested breast. Science says in the Ocean of photons in which the quark gluon plasma floated, becomes the Universe, due to Color charge, as Color charge binds the Quarks into different fermions. The ocean of unmanifested breast is the ocean of photons. The Vaisravana that enters and gets seated in the quarks are the color charge/gluon flux tubes which binds them. These form the fermions or the ‘Kurma’ of the Early Universe. From there starts the transfer of energy among matter or agni and the Universe becomes manifested. Vaisravana the color charge becomes the property of consciousness, makes the quarks/antiquarks as ‘food’ or ‘bali’ and facilitates the Yajna or sacrifice of evolution. But it is limited to the nucleonic mountains, originates from the center and is spread equally in both directions. It whips up and deforms matter and produces different kinds of matter or wealth of matter. Since Vaisravana the color charge becomes a property of the consciousness in us, hidden as the consciousness, it is said to be the brother of Sri, the consciousness in all of us. Since it produces all the wealth of matter in the Universe, by being digested, it is called the Lord of Wealth or wealth giver. Dhana-da means wealth giver. Since gluon flux tubes get deformed (break) and produces more matter, it is called Ku-Vera, which means deformed. Since it compresses the matter it is called an offspring of Vishravas or Vaishravana. Shravas means hearing or mechanical compression. Hearing happens by mechanical compression. All forces that compress are said to be off-springs of Vishravas and hence Vaishravana. According to Quantum Chromo Dynamics, the Color charge is of three types. They are denoted as Red, Blue, Green (not to be confused with real colors. These are just notations). Hence Ku-vera the deformer is depicted with 3 eyes or 3 legs. Eight combinations of these three types of color charges (in gluons) is what produces all the matter in the Universe according to QCD. The ninth combination is impossible to form. According to QCD, these eight color combinations are the ‘teeth’ by which vaishravana (color charge) grabs the Quarks and digests them into a two-quark or three-quark or more exotic quark combinations. Hence Kuvera is depicted with eight teeth. Vaisravana is depicted holding a mongoose sometimes. Mongoose devours snakes. Vaisravana devours the 'Ahi' (snakes) which are the Quarks and forms the fermionic mountains. Vaisravana or Kuvera is depicted as a drunkard because gluon flux tubes continuously drink Strong interaction or Soma or Energy.